Szoradi uses drawings and anecdotes to promote sustainability in this debut work of nonfiction. The concept of sustainability operates on many levels—sustainable homes, businesses and jobs, energy usage—all of which can improve the long-term health of the economy. Szoradi contends that the key to reaching these goals begins with the simple act of observation. 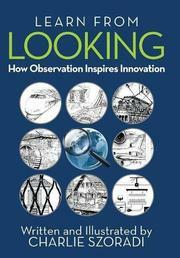 As the author explains, “Active observation can fuel critical thinking, which is often a key driver of innovation. In turn, innovation can support sustainable design that is cost-effective and practical.” The book is built around ink-on-paper drawings based on observations that the author made over the course of his travels. They often depict homes or home features that exemplify some innovative method of working with—rather than against—the natural world. It isn’t all solar panels and waterless urinals, however. An architect, inventor, and the founder of an energy-intelligent lighting company, Szoradi is a modern-day polymath with ideas on just about everything. His insights frequently return to his own life experiences, including the house he built in suburban Philadelphia that was named by Cisco Systems as one of the “most ecofriendly homes in America.” Though the frequent drawings are ostensibly the raison d'être of this volume, the vast majority of space is given over to prose, and it’s in the text that the author’s ideas are most clearly expressed. Szoradi’s expertise and facility with stats are impressive, and he says something truly thought-provoking every page or so (as when he describes how he planted shade-providing trees to the east of his house and wind-shielding trees to the north). However, frequent allusions to his own successes and his attempts to coin buzzwords like “perspectiventure” (perspective plus venture) may irk some. Readers may be as inspired to action as Szoradi insists they will, and there are some undeniably intriguing ideas here that should interest people of all stripes. A well-crafted, creative rumination on methods of viewing sustainability.